Swatch of 100% dupioni silk fabric 2 inch by 2 inch Your choice of any color from our store SPECIFY color under "comments"
Each swatch costs $1.50. Quantity =1 refers to 1 swatch. Quantity =2 refers to 2 swatches. 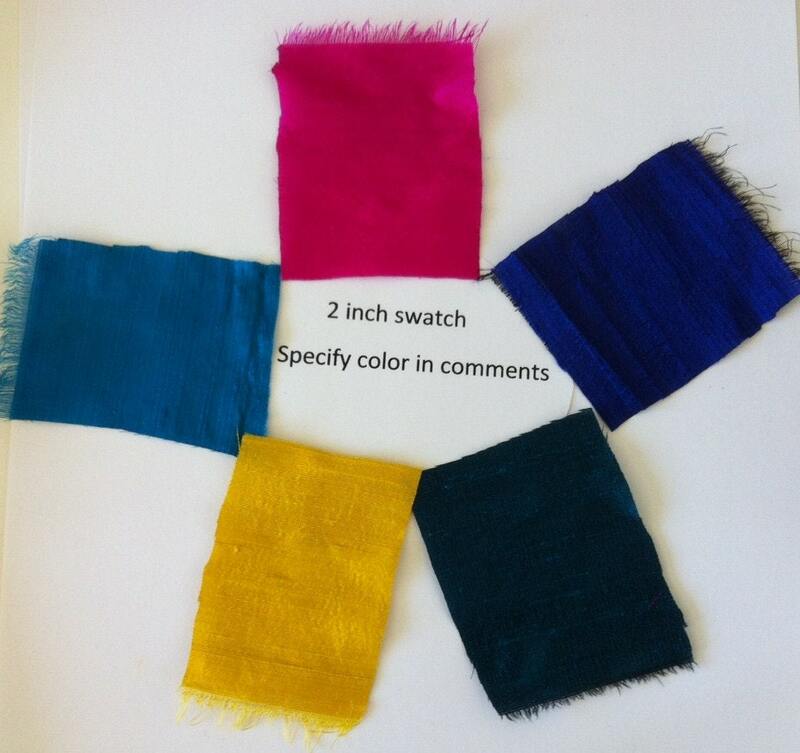 If you need one color swatch, choose 1 under quantity and specify color under "comments". FREE shipping in the USA. $1.50 total for international shipping charge up to 10 swatches. If you need two different color swatches, choose 2 under quantity and specify both colors under "comments". FREE shipping in the USA. $1.50 total for international shipping charge up to 10 swatches. Total time to reach you anywhere in the USA: 3 to 5 business days including handling time. 3 business days to the Midwest and 4 business days to the East Coast. Very quick delivery! Allow 2 weeks for international shipping to receive your swatches. Arrived pretty quickly, and it allowed me to really make sure it was the fabric I wanted. I just ordered it for my flower girl’s dress. Can’t wait. Thanks! Great to do business with this vendor. Thanks a bunch! I ordered a swatch of the red/blue iridescent and it is BEAUTIFUL. I cant wait to order more! Seller is very helpful and responsive. Thank you.